San Clemente Self Storage is committed to meeting our customer's needs, and we go above and beyond what's expected to show our appreciation for our tenants. 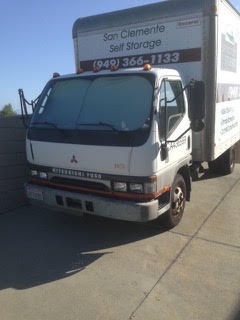 We know that you need more than just a storage unit - you also need a vehicle to transport your items to our facility. We offer this service absolutely free! All you do is load and unload the truck and we do all the rest! To help you get prepared for moving your items onto our self storage moving truck and into storage, click on the "Storage Tips" section of this website. The Storage Tips will explain the rental process step by step, suggest reasons to use a self storage unit, provide handy packing and storage tips such as why not to put your goods in used cardboard boxes, and even offer guidelines on how many boxes and other moving supplies you may need. Plus, we give you tips on how to prepare your goods for transportation in the moving truck and on how to organize them inside your storage unit. If you are new to storage, you may want to start with the first storage tip article entitled "Thinking About Storage? The Basics". In addition to the storage tips, you might want to also click on the Storage Calculator tab, which is an interactive program to help you determine what size storage unit you need. Please call San Clemente Self Storage at 949-366-1133 to reserve your free move-in truck for the day that you intend on moving into your storage unit. To learn more about the storage truck or our facility, please contact us. We are happy to help you!